Corporate Counsel: A Distinct Branch of the Legal Profession? What Makes a “Good” Law School? The bundle of rules and principles commonly described as the “right to silence” provide important mechanisms for a person to lawfully resist the coercive powers of the state to obtain information. In recent years, as criminal activity has become more sophisticated, governments in Australia have created a number of statutory crime commissions with the power to conduct compulsory examinations, thereby eroding many of the rules and principles forming part of the right to silence, such as the privilege against self-incrimination. Due to the increased use of coercive investigatory tactics by statutory commissions, courts have been called upon to deal with the legality of compulsory examinations in regard to their effect on the traditional rights afforded to an accused in a criminal trial. 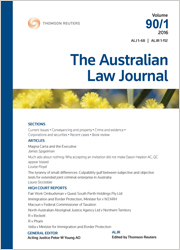 This article examines seven recent Australian cases which deal with this issue and demonstrates the ways in which the right to silence is being eroded by coercive investigations. The Full Court of the Federal Court of Australia has held that it is permissible to make orders in a class action to allow a litigation funder to be the beneficiary of a “common fund order”. This development holds out the prospect of supporting an open class definition, reducing the occurrence of competing class actions and lowering litigation funders’ fees. Such outcomes may in turn improve access to justice and the efficient resolution of disputes. Equally, the common fund may be argued to induce more class actions and a race to the court house leading to speculative or ill-founded claims. This article examines whether the above outcomes will occur and what factors will influence the achievement of such outcomes, including the incentives faced by litigation funders. There have been recurrent proposals for the creation of a national court of appeal. These proposals have not, thus far, been acted upon. The idea of a national court of appeal recently resurfaced in a speech given by the Chief Justice of Victoria, Marilyn Warren. In this article, I contend that a national court of appeal should not be established. That is so because the creation of a national court of appeal would upset the present appellate hierarchy, which, unlike the system that would exist if a national court of appeal were established, reflects a subtle balance between the requirements of consistency and comity, and the principle of federalism. Further, the extant system affords proper respect for the High Court’s role as Australia’s ultimate appellate court and its consequent position as conclusive arbiter of the single common law of Australia. For the PDF version of the table of contents, click here: ALJ Vol 91 No 8 Contents.